Since 2006, the Port Authority of New York has been giving away thousands of pieces of World Trade Center steel artifacts to police, fire and government departments across the United States to memorialize the victims of the September 11th attacks. Over 2,200 chunks of steel that had been stored in a 80,000 square foot hangar at John F. Kennedy International Airport, have been distributed by the Port Authority to agencies all over the country. Using these world trade center artifacts, all fifty states in the United States have created memorials of the tragic events of September 11 that have become part of the healing process for victims, families, and the general public. The owners of American Freedom Distillery, former special forces operatives who were first responders of 9/11 often referred to as the “Horse Soldiers” for their valiant efforts in Afghanistan, got the last piece of World Trade Center steel in the Fall of 2018. 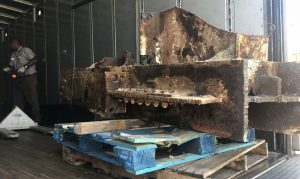 The beam was unearthed during the site preparations for America’s Response Monument ‘Horse Soldier Statue’ at the National September 11th Memorial Museum in New York City, and given to the owners of American Freedom Distillery. 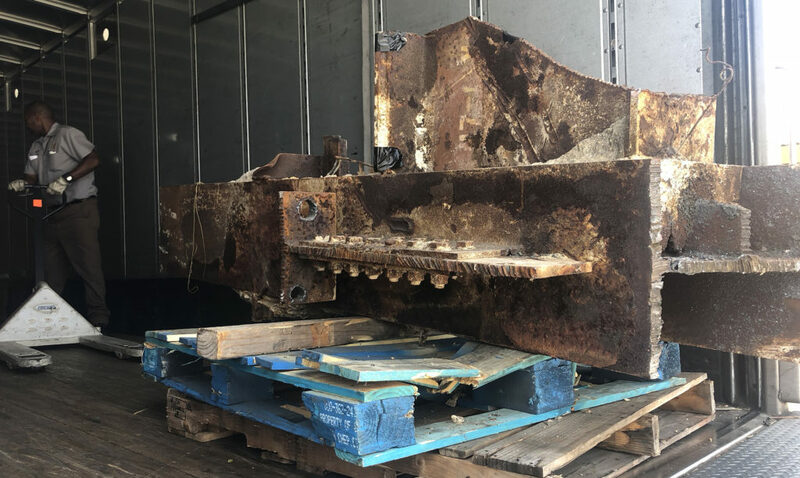 Through the efforts and connections of the American Freedom Distillery team, the 800 ton piece of steel made its way down to their home base in St. Petersburg. While the American Freedom Distillery team wanted a place to remember the events of 9/11, they also wanted to create a place that honors how our country came together to help each rise after the tragic events. 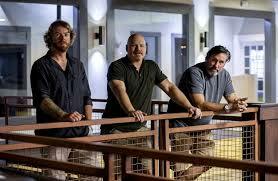 And like them, former first responders, there is the next phase of life after 9/11. Partnering with the Warehouse Arts District and sculptor, Mark Aeling, the steel beam will now serve as the centerpiece for Rise. Rise will be a monument that serves as a symbol of America’s resiliency and will be dedicated to 9/11 community heroes, first responders, the events of that day. This Monument is a gift of American Freedom Distillery and The Warehouse Arts District Association and made possible through public and private donation. Open to the public September 11th 2019.